Shortly after Confederation, an economic crisis forced Canada to adopt a new national vision and turn its attention to its vast, sparsely settled west. Canada's first depression brings unemployment, hunger and death. In 1873, Canada was engulfed in an economic depression, which caused poverty and suffering throughout the country. Alexander Mackenzie was prime minister during the darkest years of the depression in the mid-1870s but offered few concrete ideas for helping the country. Former Prime Minister John A. Macdonald lingered on the political sidelines after resigning over a railway scandal in 1873. But Macdonald had a plan to regain power and lift Canada out of its economic doldrums. In the 1878 electoral campaign he proposed an economic plan called The National Policy. The economic crisis had demonstrated an important problem: Canadian products were incapable of competing with lower priced American products flooding into the country. Macdonald proposed protecting Canadian industry by raising tariffs on certain imports. As Macdonald developed his National Policy, he added a role for the West. Canada's western frontier was a massive, sparsely settled territory purchased by Canada from the Hudsonï¿½s Bay Company in 1869. It was eight million square kilometres, which included parts of what are now northern Quebec, northern Ontario, Nunavut and most of the Prairies. Macdonald would have preferred to ignore the western frontier for a while, but he feared the Americans were eyeing the land for themselves. The National Policy evolved into a plan that would expand Canada's economic development westward. His plan saw the Canadian prairies becoming the greatest wheat-growing region in the world. It would become the breadbasket of the British Empire. He wanted the unprocessed wheat to be shipped east where eastern manufacturers would process the grain to be shipped to England and the rest of the British Empire. Macdonald also wanted eastern manufacturers to build the machinery the western farmers needed to create this huge wheat and cattle operation in the west. Of course the whole scheme would be tied together by his pet project - the great transcontinental railroad. Macdonald won the 1878 election and soon his National Policy was put into action. Canadian business responded to the new protective policies. 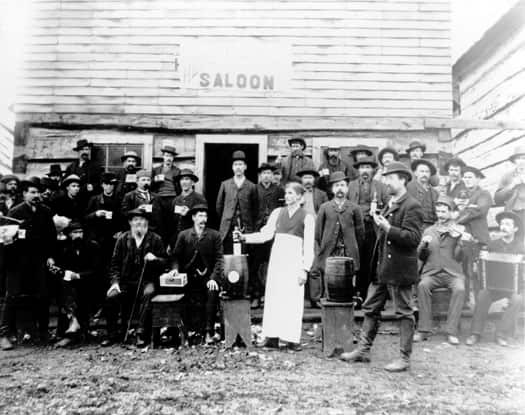 New industries emerged and Canada's economy flourished in the 1880s. Money flowed into the government's coffers and now Macdonald had the capital to extend the railroad across the prairies to British Columbia. Soon, the trickle of settlers heading west became a flood.